The new system for router installation and paperwork is proving successful and increasing our efficiency. We should now have a steady revenue stream of grant funding coming into Michaelston-y-Fedw Internet CIC as new connections are being completed. There are however, still a small number of people that have not completed the grant process so we cannot be paid for their connection, and some who have not completed the GoCardless setup for future payments of their subscription. If you are one of these please help us all by finishing the process. If you need help with this just drop us an email to info@myfi.wales and we will assist you. What a busy fortnight we have all had! 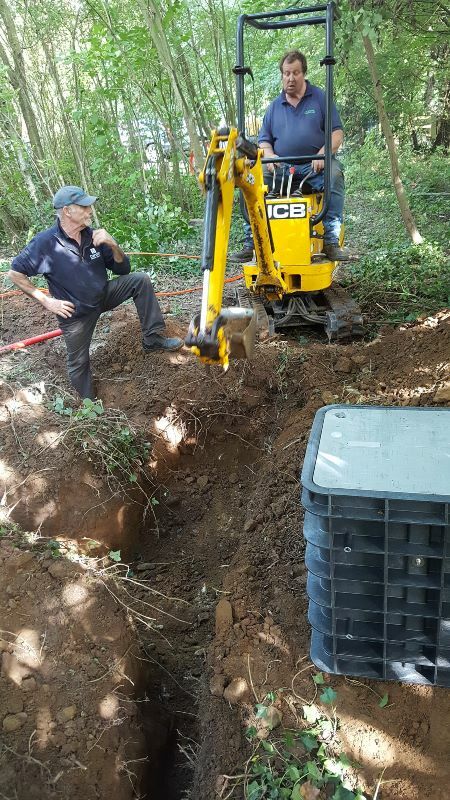 Thompson Directional Drillers made it to us on Friday and Saturday completing a difficult river crossing where they had to drill 8 feet under the river before coming up into the woods at Cefn Mably Fishing Lakes. 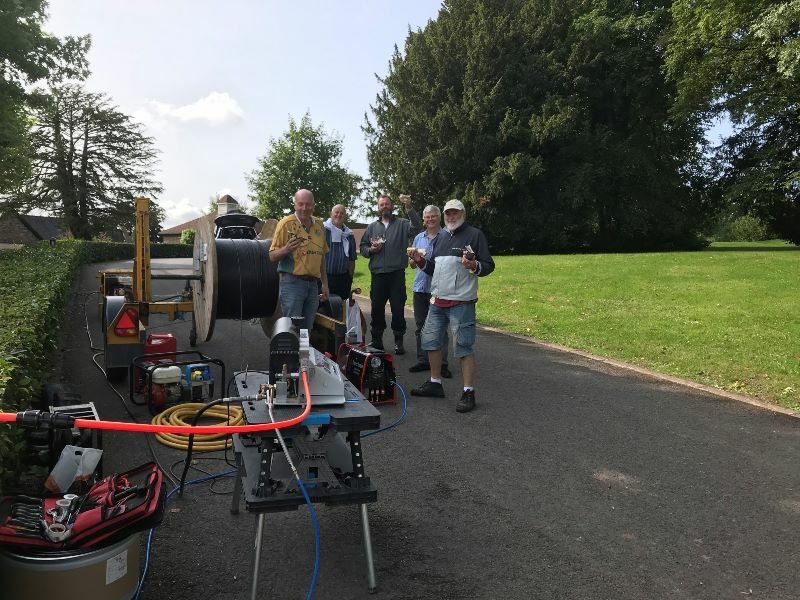 The road crossing from there to the bottom of Cefn Mably Park was also completed which now means that we can blow the fibre up to Cefn Mably Park. A chamber was installed in the woods at Cefn Mably Fishing Lakes on Saturday and we had a great team of volunteers to help run out the 16mm ducts and 15 lengths of 7mm duct which were then pulled through; 7 from back to the chamber in Ollies field and 8 across the road that take the fibres to the back of Tai Derwen. Huge thanks to John, Lawrence, Dave, Jim, Ollie, Gareth, Brin, Mark, Sukhdev, and Carina for getting this done within the day. Special thanks go to John Jones for keeping the troops fed and watered with bacon rolls and drinks and to Sukhdev’s wife for the tasty Lamb curry wraps and beer ! We couldn’t have done it without you ! A hard day’s work for all but very rewarding to see such progress, thank you to everyone involved. Chris and David Walford continue to trench their way around the village, and as I type this David is trenching from the Clubhouse at Cefn Mably Fishing Lakes and is fast approaching properties on the opposite side of the road to Tai Derwen. Keep going Dave, we are all very impressed at the kilometres you are “eating up” and the map has very little red and blue lines left to trench. The total of trenches to be dug are about 25 Kms and 75% of it is now complete. Thank you guys, both Thomas Brothers and Chris and Dave Walford, for almost completing this very important part of our project. 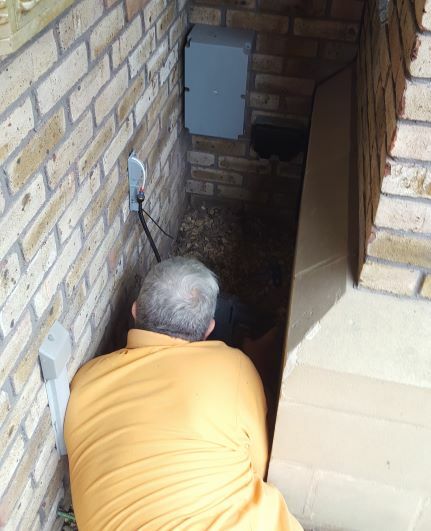 Jim and Glyn continue with the installation of Fibre Terminaion Units (FTU’s) and now have a total of 83 fitted. Almost half way, and they are very grateful for the tea, coffee, cake and bacon sandwiches that have been offered and not often refused ! Carina and Jim installed the splice bullet into the chamber at Cefn Mably Fishing Lakes this Friday, at the same time feeding the surplus fibres through from Ollie’s chamber and are now ready for splicing. Carina and Mark Graveston worked on the “live” fibre in the Fairwater Farm entrance on the left hand side to open up a tube of 12 fibres to connect surrounding properties. I am very grateful for Mark’s support because this was always going to be a challenge. Working with live fibre brings about a risk of cutting off 24 customers if things go wrong !!!! But we have not had any irate customers phoning to say they had lost their connection so it was a huge relief all round. We were able to make an additional 2 live connections with 3 more ready once FTU’s are fitted. 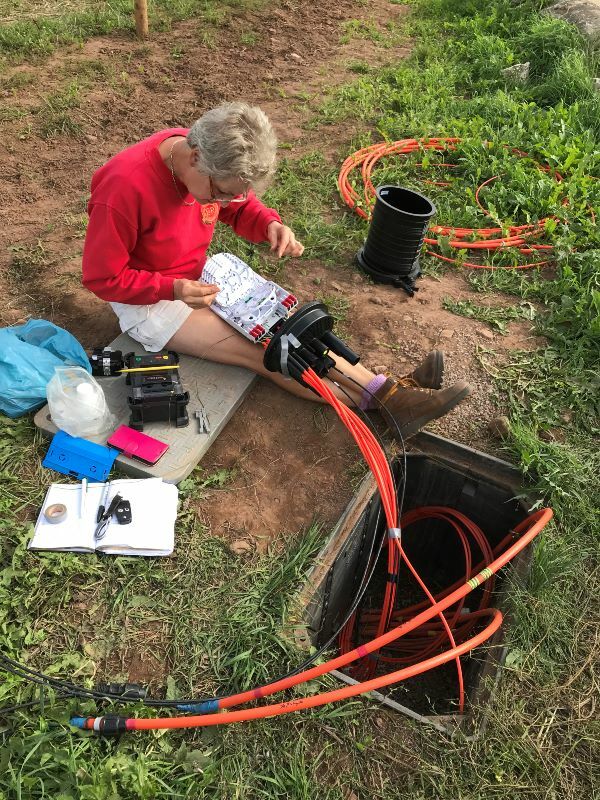 Carina and Jim installed the splice bullet to the chamber on the right hand side of Fairwater Farm and I continue with the mammoth task of splicing at various chambers. I am getting the hang of it now !!!! 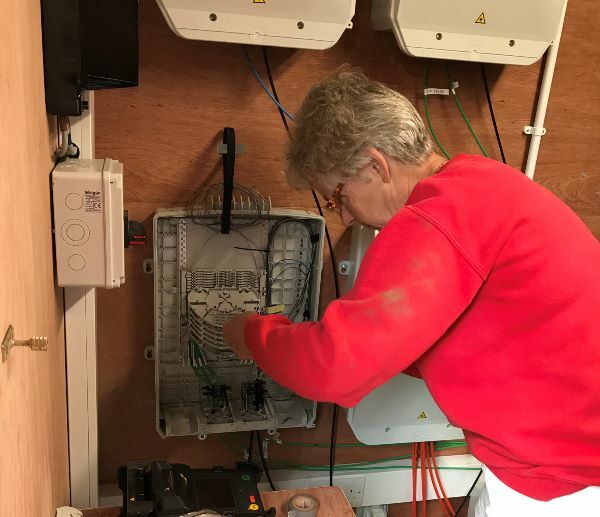 144 Fibre has been blown to the chamber in Cefn Mably Fishing Lakes and is now ready for the 72 fibre to go up to Cefn Mably Park which will be completed on Saturday. There was huge support, with the biggest turnout from volunteers on Saturday, at Cefn Mably Fishing Lakes. A tough but fun day was had by everyone, thank you once again. 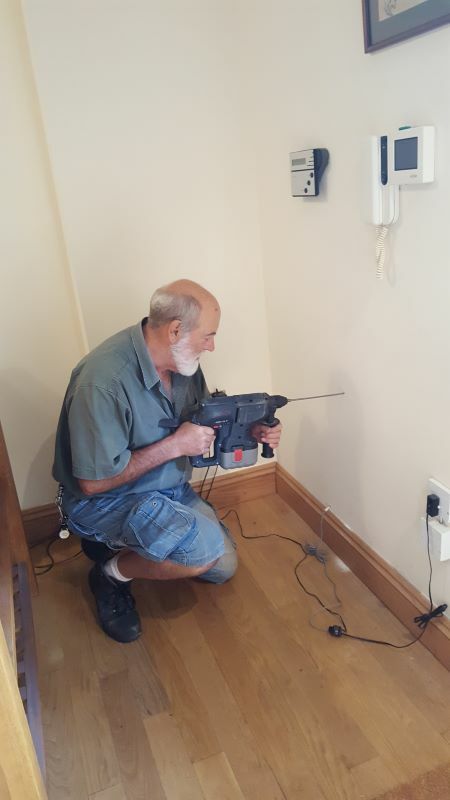 As always we continue to rely on volunteers being a part of our project to remove the need to buy in services if we are able to complete them ourselves. The work at Cefn Mably Park continues with ducts being pulled through the existing chambers and pipework, fibres being blown, FTU’s fitted and pigtail leads spliced. It won’t be long before the first of the connections are live. I know that the excitement is growing and all the hard work by the amazing team of volunteers is very much appreciated. Also, much like the village, more people are getting to know each other and it is bringing the Cefn Mably Park community together too. Doesn’t it give you a lovely warm fuzzy feeling ? There is still the opportunity for the remaining few at Cefn Mably Park to join up and be on the receiving end of Gigabit internet under the Grants Scheme. Please remember that if you have not completed your grant application and returned your funding letter to Welsh Government then we are not able to connect you. David Walford continues along Penylan up to a high pressure gas main which we need to cross in 3 locations... This is a new challenge for us as it requires a Risk Assessment and Method Statement and will have to be hand dug in places. Everything is running smoothly in the Hub and the ambient temperature is distinctly cooler with the new Air Conditioning system. Saturday will be the day we blow the 72 fibre from Cefn Mably Lakes up to Cefn Mably Park. Thompson Directional Drillers will be back with us next week to do more crossings. David Walford will complete the trenching at Mr & Mrs Gregsons and will then concentrate on Penylan. This date has been booked in the Village Hall for a clinic. Simon Peat, the National Account Director with Vonage, will be here to give advice and demonstrate equipment. We have set up a partnership deal with them and for each customer that signs up a £40 signing on bonus will be paid to Michaelston-y-Fedw Internet CIC which will be placed into a separate fund and shareholders will be able to vote on a number of options for the community to benefit. https://www.vonage.co.uk/myfi-wales (a dedicated website page) and a direct telephone number has been set up. Here you can order the service, port your existing number to Vonage and find lots of advice. This can get very technical and so it will probably be very beneficial to come along and see how you can get the best out of the Gigabit internet around your home. James has already provided some great solutions for other people in the village so come along and see how he may be able to help you. The date of the next meeting is Thursday 6th September 2018 at 7.30 P.M.